Palestinians in the occupied West Bank are about to receive a special delivery of more than 10 tonnes of mail that has been delayed by Israel for the past eight years. 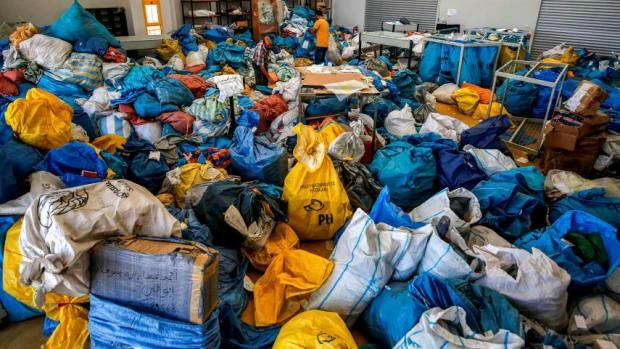 Postal workers have been sorting through thousands of mail sacks in the West Bank city of Jericho for the past several days after Israeli authorities allowed the entry of the letters and packages from neighbouring Jordan. The 10.5 tonnes of mail had been held in Jordan since 2010 because Israel would not permit direct transfer to the Palestinian Authority in the West Bank, Palestinian officials said. Mail for the West Bank and Gaza Strip, the borders of which are under Israeli control, first passes through Israel, enabling it to perform security checks. Israeli authorities said the transfer was a one-time gesture and moves were under way to implement a 2016 agreement that would enable direct international mail links with the West Bank. At the Jericho facility, a wheelchair and toys were among the items being sorted. "A team was formed from across the city (Jericho) to deliver (the mail) to the people as soon as possible," said Hussein Sawafta, director general of the Palestinian Post Service. But Ramadan Ghazawy, a Palestinian postal official, said some material could be difficult to deliver because the contents had spilled out of damaged envelopes and boxes, while the addresses on others were unclear. "There are toys for kids. Maybe they were one year old when those gifts were sent. Now they are eight," Ghazawy said.